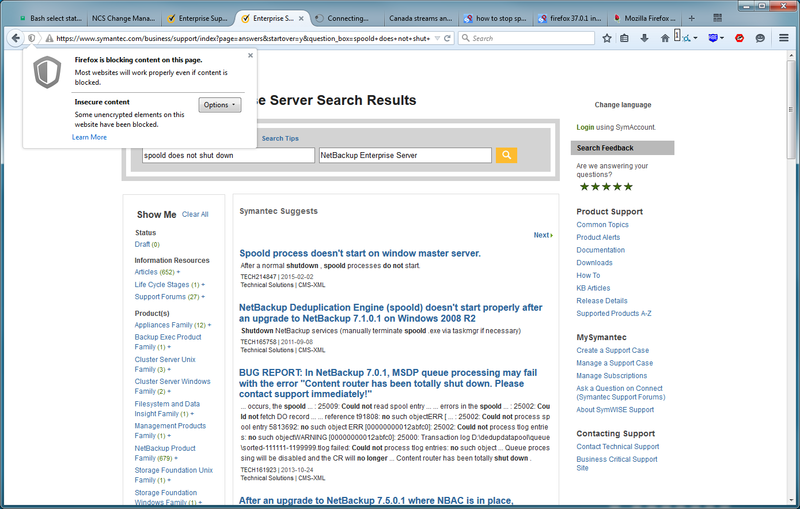 Random Scribbles: Firefox 37.0.1 - Is insecure content blocking new? Firefox 37.0.1 - Is insecure content blocking new? I got the upgrade notification for Firefox yesterday and as normal, I clicked on "Restart" to upgrade Firefox to 37.0.1. After the upgrade, I noticed a change: some CSS content was not showing on normal sites and hence had a lot of portions of the page (mainly background) as white! I thought it could be something to do with my browser after upgrade, so I restarted it again. No change. After checking for new features, nothing was to be found. Then I noticed the "shield" icon on the left of the address bar and clicking it explained it all (see image below). The content was being blocked by Firefox as it was not using https:// on that secure page. Is this is a new feature in Firefox? Ideally it would be more secure if every secure page had just securely linked components but this can be quite annoying to users if there is no clear warning to the user. Even though I'm familiar with a fair bit of Firefox technical details to be able to troubleshoot my issues, regular users will be stumped!